British media say government officials have been turning to Japan for help in avoiding American sanctions on Iran. Britain is asking the United States for permission to be exempted from some of the measures. British officials are said to be especially interested in having strong banking ties with Iran and imports of Iranian oil. A few weeks ago, the U.S. government re-established restrictions on trade with Iran. Those sanctions had been suspended under a 2015 nuclear agreement between Iran and world powers. But the government is now enforcing them after President Donald Trump withdrew the U.S. from the agreement. Media reports say British officials have been asking Japanese officials how they were able to avoid parts of earlier sanctions against Iran. In the past, Japan was able to continue signing oil deals with Iran, as well as other business agreements, without honoring U.S. sanctions. The latest U.S. sanctions punish any foreign company that deals with Iran. They bar those companies from doing business in America. That threat has already persuaded more than 50 Western businesses to suspend their operations in Iran. The companies include French automakers Renault and Peugeot, the French oil company Total, Germany’s Deutsche Bahn railway business and Deutsche Telekom. British ministers have said they hope to secure exemptions from sanctions for oil imports, banking and insurance policies for oil transport ships. British officials have expressed concern, however, about the position of a gas field about 386 kilometers from Aberdeen. It is owned together by BP and an agency of Iran’s state-controlled oil company. 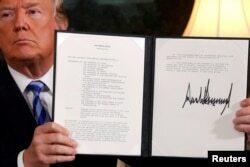 U.S. President Donald Trump holds up a proclamation declaring his intention to withdraw from the JCPOA Iran nuclear agreement after signing it in the Diplomatic Room at the White House in Washington, May 8, 2018. Britain’s Foreign Office has released a statement on the reported talks with Japanese officials. It says diplomats are working with European and other partners to guarantee that Iran continues to benefit from an easing of sanctions. The statement adds that Iran must keep meeting its promises under the nuclear deal. 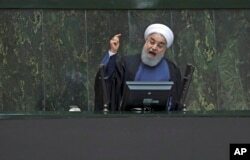 On Tuesday, Iranian President Hassan Rouhani was questioned in parliament by the country’s lawmakers. They asked him about the effect of the U.S. sanctions on Iran’s weakening economy. His answers failed to ease the concerns of lawmakers, who voted to reject most of them. A few weeks ago, parliament impeached Iran’s economy and labor ministers because of the growing anger about the economy. Iranian President Hassan Rouhani speaks in a session of the parliament while answering questions of lawmakers, in Tehran, Aug. 28, 2018. To keep open financial links with Iran, the European Union has taken steps to fight the U.S. sanctions, including barring EU citizens and businesses from obeying them. The European Commission added to a blocking requirement on August 7. The measure bans companies from following the sanctions unless permitted to do so by the EU leadership in Brussels. This would enable EU businesses to recover damages resulting from the sanctions. But many companies say they fear losing current or future business in the United States. “Under these conditions it is very difficult,” noted Louisa Santos, the Director for International Relations at BusinessEurope. She says even small and medium-sized businesses that do not trade with the U.S. will face problems because they will need financing from Western banks. The first in a series of U.S. sanctions on Iran officially took effect earlier this month. They block any business deals with Iran involving dollars, gold, precious metals, aluminum, steel, commercial passenger aircraft, shipping and Iranian seaports. Even stronger sanctions will take effect on November 4 as the U.S. government seeks to damage the Iranian economy. In early August, Woody Johnson, the U.S. Ambassador to Britain, warned of effects on trade with Britain, which he described as the closest U.S. ally. He urged Britain to break with the EU and follow the re-imposed sanctions on Iran. Jaime Dettmer reported this story for VOANews.com. Phil Dierking adapted his report for Learning English. George Grow was the editor.